It is a well-known fact that not all businesses are successful. In fact, statistics show that a very small percentage of them manage to survive beyond a couple of years and among them, a handful go out to make a big name for themselves. The cryptocurrency industry is no different as they tend to follow a similar trend. The number of failed projects and dead coins is a proof of that. So, what happens to those businesses that have failed or on the verge of failing? In most cases, especially if there is a sound business model, a decent userbase or a market disruption potential involved, they get readily acquired by bigger businesses. Generally, the acquiring company either assimilates the know-how of the business into its own portfolio or further strengthens its foothold in the market by expanding its customer base. But in the case of crypto-projects, it is different. Once a platform goes defunct, the associated cryptocurrencies lose their value and those holding it will be left with no option to either convert or exchange them to other tokens or fiat. This will lead to loss of liquidity in the market with funds trapped in worthless tokens. CoinJanitor is a project that aims to solve this problem. The project provides a way for the crypto-community members to convert their dead coins into its native currency, which could be later exchanged or traded like the top crypto-assets. 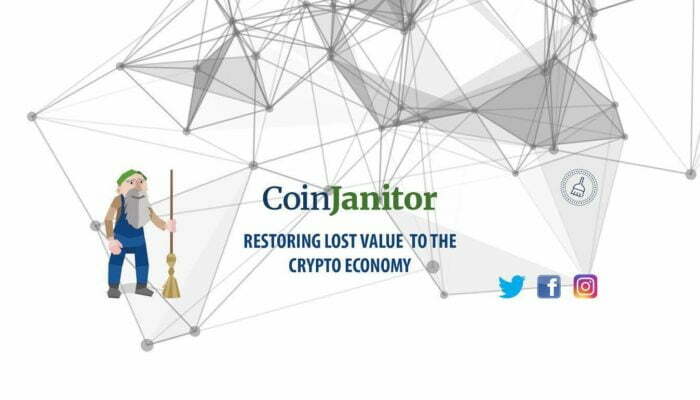 As a part of its community-driven initiative, the CoinJanitor project is on a mission to clean the cryptocurrency ecosystem by getting rid of dead coins and defunct blockchains. While doing so, the platform releases the value trapped in those circulated coins which have since then be rendered useless. The CoinJanitor project is focusing on PoW-based cryptocurrencies with over 2 years of existence and has a market value of less than $50,000. In addition, these coins shouldn’t be traded on any exchange or trading platforms. After profiling the dead coins and their associated blockchain projects, CoinJanitor goes ahead to acquire the assets belonging to that project against payment in the platform’s native CoinJanitor token. Once the project assets including GitHub and other code repositories, marketing materials etc. are bought from their respective owners, the platform will decommission the blockchain by burning the acquired “dead coins”. CoinJanitor, like any other sustainable business in the real world, is creating a win-win scenario for both itself and the community as a whole. By acquiring and decommissioning the dead blockchains and associated tokens against CoinJanitor token payment, the project expands its user base. At the same time, those receiving these tokens in return for dead coins, get a chance to use those coins for trading or exchange to other crypto or fiat currencies. Apart from the value of coins, there is yet another huge benefit to the cryptocurrency and blockchain community – Open Source Blockchain Library. CoinJanitor will make the acquired codes available to the public in the form of a blockchain library. Anybody who is working on a blockchain project or wants to understand the development of such projects can easily access the code base, conduct research and build their own products. CoinJanitor has a strong model, built around its native tokens. These tokens will replace the dead coins and help buy-out projects and their code bases. To do so, the platform has organized a crowdsale, to raise the necessary funds and gain early adoption from the crypto-community. The token sale is set to go live from May 1, 2018. During the token sale, participants can purchase the tokens at a price of $0.17 a piece, against payments made in BTC ETH, USD and over 40 other altcoins. The platform has set a maximum token supply cap of 100 million and an ICO hard cap of $7.5 million. Follow CoinJanitor on Twitter, Facebook, and Telegram. What do you think about the CoinJanitor project? Leave us your comments in the section below.